When it comes to testing services, General Plastics isn’t satisfied with just doing the bare minimum. Quality Solutions Director Tod Maurmann works with the entire quality test lab to build and develop our testing services, which aren’t just limited to General Plastics’ products. “We’re trying to grow customers who don’t necessarily buy our product, but need testing services,” said Maurmann. Maurmann emphasizes that materials testing is vital for a variety of industries to ensure that products are meeting customer specifications , whether it’s being used in construction, aerospace, or a nuclear transport container. For example, flammability properties meeting the safety requirements are critical to ensure that a product won’t contribute to a fire. Testing turn-around times vary on test type and conditioning requirements. Test data may include physical property data, flammability, and feature graphical elements, including photos and videos. Although testing services are not exclusive to General Plastics, we’re one of only nine facilities in the United States that performs the seat oil burner tests, and this unique feature has attracted customers from Japan, the United Kingdom, and China. But that service alone isn’t what makes General Plastics stand out when it comes to testing. As a “solutions provider,” we seek to help customers develop new projects, run quick developmental tests, and maintain full transparency. But if after a consultation you decide General Plastics doesn’t have the capability you need, our team is more than happy to pass along recommendations. “We have fun with this stuff, we want to see our customers succeed, and we want to help them get there,” said Maurmann. 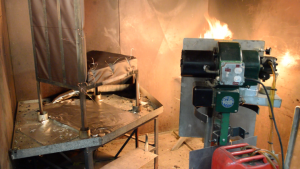 General Plastics’ main testing services are divided into two categories: flammability, and physical properties testing. These services support R&D projects as well as product certification. These tests are conducted in accordance with FAA, Underwriters Laboratories (UL) or other customer requirements. The facility itself is listed as an FAA approved test facility. Small scale testing, such as horizontal, vertical, and 45 degree Bunsen Burner tests use samples that are 3×12 inches, involves mounting the specimen in a draft free cabinet and holding the flame beneath it for specified amounts of time. The flame is then moved away and the time is recorded for the material to self extinguish. Burn lengths and burn rates are also specified for many tests. The seat oil burner test, for which other companies come to General Plastics, tests representative samples of aircraft seat cushions by using a larger scale oil burner with an internal blower. To conduct the test, the seat cushion specimen, is placed on a chair-shaped metal frame and a 1900?F flame is applied for two minutes. Once the flame is removed and the specimen self-extinguishes, burn length and weight loss are recorded. Physical property and development testing merge when it comes to testing material strength or how a material responds in different situations, such as supporting heavy loads, going underwater, or being flexed or stretched. General Plastics’ lab features universal test machines (UTM’s) that crush or compress a material in order to measure the deformation and movement of the material under the pressure as well as stress and strain properties. Other tests include the tensile test, where elasticity is measured as the material is stretched until its breaking point, and the shear test, where a material is being torn or driven through a shearing action. “So, for example, imagine you’ve got something on the table. You’ve got your hand on top, trying to tear in a sliding fashion along the thickness of the material,” said Maurmann. Materials can also undergo impact testing, where a weight is dropped or smashed onto the material to gauge impact forces and energy absorption of material, similar to a car crash test. “Just this week we had an inquiry from NASA, saying that they have a piece of equipment they want to protect up to 5G forces. In that case we can say, if your object is dropped from X height and it weighs X much, this is the type of foam you need to put around it to absorb the impact and protect it,” said Maurmann on how this test is often used in nuclear applications. The thermal conductivity test measures transfer of heat, resistance of heat, insulating value, and U-value of a material. The extreme weather clothing industry can benefit from this type of test. No matter your testing needs, General Plastics goes above and beyond for our customers to ensure new opportunities are explored and new products are successfully developed.